The Slidell Library was built about 35 years ago and badly needed an update. Our task was to replace the existing lighting fixtures with something fresh and eye catching. We started with the 4 lamp parabolic fixtures and replaced them with 2 lamp T5 high energy efficient fixtures one for one and increased the lighting levels. We changed the stack lights to new linear fixtures with incredible reach to bottom of the stacks. We deliberately placed 4 foot diameter fixtures in strategic locations to catch your eye as you walked in and in the kids zone for a modern look. 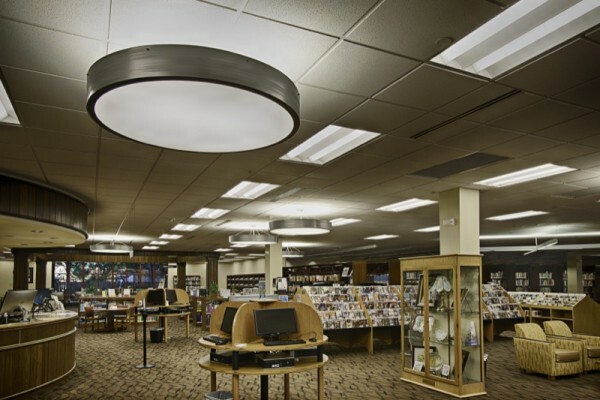 The reference/reading area was highlighted with three 16 foot ‘X’ fixtures to add diversity and contrast to the look of the lighting. The most beautiful transformation was in the two coffers. We removed the 4 x 4 parabolic fixtures and replaced them with skylight fixtures and they receive the most comments from the users.